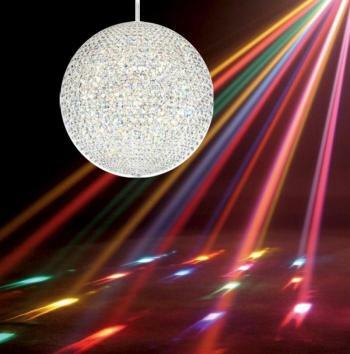 A Crystal disco ball to celebrate the crystal anniversary of the Disco. 'tute's entry into the creationism business. Fifteen years ago yesterday, a mail clerk in Seattle was handed a document to copy. As the Seattle Weekly reported, the packet was labeled “TOP SECRET” and “NOT FOR DISTRIBUTION,” and the cover sported an Illuminati-esque triangular design and a copy of Michelangelo’s “Creation of Adam.” The title: “The Wedge”; the author: a newly-created division of the conservative Discovery Institute, the Center for the Renewal of Science and Culture (CRSC). Later, the Center would drop “renewal” from its title to escape the religious reference, and also switched its logo from the Creation of Adam to a picture of God creating DNA, then to a more secular galactic nebula, and now a mashup of Leonardo’s Vitruvian man and a DNA strand. Of these, the first has certainly not happened within science. The second is immeasurable, but hasn’t happened in any obvious way, and to the extent there are new debates in the fields described in the third item, the CRSC seems to have no role to play (aside from sitting on the sidelines and carping). While there have been public events staged in which ID creationists and evolution’s defenders squared off, any grand debate died off long ago, and was ended for good with the Kitzmiller v. Dover ruling. Unless one really stretches the meaning of those “cultural implications,” or includes the heaps of books written to debunk ID creationism, I don’t think they can claim success here, either. Unless you count articles published in the various unimpressive and intellectually incestuous ID journals that have come and gone over the years, or include papers that have nothing to do with ID creationism, they haven’t met this standard, either. Even the CRSC’s own list of publications only hits about 75 items, and most of those are not in credible journals, or don’t mean what the Center claims they mean. While ID creationism has gotten its share of media coverage, and even some cover stories, I wouldn’t say that coverage has been especially favorable. A skim through the CRSC’s media complaints division suggests that they don’t think so either. Certainly no favorable NOVA documentaries—although NOVA’s Judgment Day: Intelligent Design on Trial did treat ID creationism (IDC) fairly—and since there is no “design theory” to make advances in, there’s been no media coverage either. Many mainline Protestant churches (and their seminaries) have issued policy statements in favor of evolution in recent years, and against IDC, while the CRSC’s allies in the older creationist organizations have backed away from IDC since its failure in the Dover trial. Public opinion polls show increasing acceptance of marriage equality, views on abortion are quite stable, and belief in God is declining. No state science standards cover creationism, not even in the deracinated form of ID creationism, nor does any textbook from a major publisher. Coverage of evolution has increased since the ‘90s. There’s a group in the UK promoting IDC with little success, but no such movement in Israel or any other country. The CRSC fellows are not to be found at major universities; a couple are at UT Austin, and some at Baylor, but before you’d need two hands to keep count, you’d have to stretch the definition of “major university” beyond any meaning. “Design theory” doesn’t exist, and isn’t a dominant view at any university, nor is it relevant in social science research (except for sociologists interested in why people deny science). Nor do any lawyers seem interested in ID creationism, except for civil liberties lawyers. Paul Nelson…CRSC Fellow will very soon have [a] book published by…The University of Chicago Press…Nelson's book, On Common Descent, is the seventeenth book in the prestigious University of Chicago "Evolutionary Monographs" series and the first to critique neo-Darwinism. Fifteen years later, Nelson’s book remains unpublished, to the point that it became a running joke among anticreationist activists of a certain vintage. To see design theory permeate our religious, cultural, moral and political life. I am willing to wager a bottle of single-malt scotch that they fail. And unlike some people, I’ll even pony up if I lose.